If you have no idea how Snapchat works, then this video might help. It comes straight from the CEO's mouth, even if it was done in a distinctly low-budget fashion. 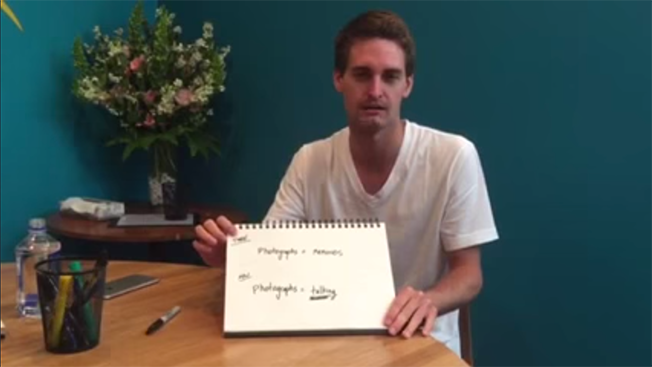 Snapchat's chief executive, Evan Spiegel, just posted the company's latest video to YouTube. It's tutorial on how the app works, and why 100 million people—mostly young kids—are on it all the time. At 240 pixels, it probably is the lowest-definition production from a $16 billion company ever. The sparse video does get to the point, helping parent-types understand what kids are doing taking pictures all day. Spiegel, who is 25 years old, explained that parents might be confused, because when they were growing up, photos were shot infrequently and carefully, documenting only precious moments and not wasting finite film. "When you see your children taking a zillion photographs of things that you would never take a picture of—it's because they are using photographs to talk," Spiegel said. Moments later, he continued, "That's why people are taking and sending so many pictures on Snapchat everyday." It's in the name: snap and chat. In fact, there are estimates that Snapchat users share more than 750 million photos a day, more than are shared on Facebook. Anyway, this could be a preview of some of what marketers are in for at the Cannes Lions International Festival of Creativity, when Spiegel speaks there next week. He will be discussing how his app is developing for millennials as well as riffing on their consumption habits.